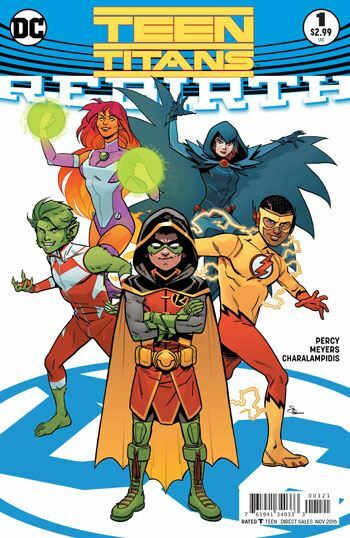 A new line-up for the Teen Titans gets formed in Teen Titans Rebirth, by Ben Percy and Jonboy Meyers, and the readers will have a lot more fun seeing it come together than the heroes did experiencing it. That’s because the story is told by seeing the various youth getting taken down and made captive by a malevolent force. The line-up includes the classic New Teen Titans Raven, Starfire and Changeling. Each gets a really well done solo sequence, developing their very diverse characters. The Starfire section picks the character up from her solo series, and Raven’s ties in with her new solo book. Changeling’s reflects his past interest in a film career, but shows how uncontrollable and basically irresponsible Gar Logan is as well. Damien Wayne pretty much steals the show with his moment in the spotlight, but we get to see the new Wally West as Kid Flash in a way that has yet to be shown in the Flash’s book. His inclusion means that there will be Wally Wests in both the Titans and the Teen Titans, but different characters. That’s a bit odd. The art is excellent, the writing is fun and engaging, and the ending was the cherry on top. A really enjoyable Rebirth, giving me high expectations for the new series.